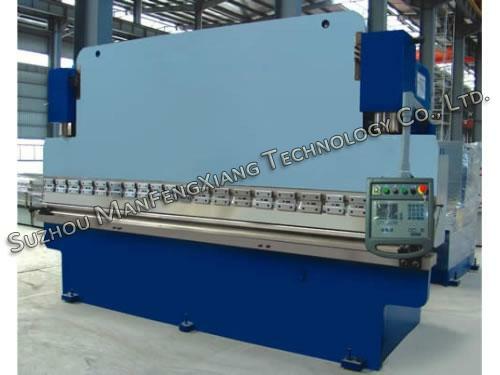 CNC hydraulic press brake is a machine tool for bending sheet and plate materials, especially sheet metal. It forms metal materials into desirable shapes by clamping the workpiece between a matching punch and a die. This sheet metal bending machine is constituted by machine stands, workbenches and clamping piece. The workbench locates upon the stand and it is made up of the base frame and the work table which are connected tightly with each other through chains. The base frame is composed of housing, coils and cover. 1. CNC hydraulic press brake is featured by advanced configuration, high precision and high efficiency. 2. Many electrical and hydraulic elements are from high-grade international brands. 3. Whole welding structure is treated by annealing. Hence, machine body is in strong and rigid structure. 4. Three axes is adjustable, respectively in Y1 (upward-downward of left cylinder), Y2 (upward-downward of right cylinder) and X (forward-backward of back gauge). 5. A set of standard tools are equipped with each CNC hydraulic press brake. 6. Sliding block is driven by hydraulic cylinder at both ends of the workbench. 7. Sliding block is synchronized by torsion shafts. 8. Sliding stroke is both electrically and manually adjustable, and the related data is displayed by the counter. 9. Deflection compensation is realized through wedge-type design, so this CNC hydraulic press brake is of high bending precision. Our tube mills, roll forming machines and other products have been sold to more than 50 countries and regions, including Russia, France, England, Australia, America, Kazakhstan, Tajikistan, Malaysia, Nigeria, Romania and Albania. Our products have won acclaim from all customers at home and abroad. SUZHOU MANFENGXIANG TECHNOLOGY CO.,LTD. is always ready to provide the best solution for your production requirements.